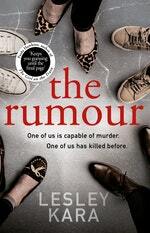 In my novel The Rumour, which takes place in a small seaside town, Joanna, a young mother, hears a rumour that someone who killed a child when she was just ten years old is now living locally under a new identity, and although Joanna never intends to pass the rumour on, one casual comment leads to another and sets off a catastrophic chain of events. I started writing this novel in August 2017, but the original idea came to me a few years before when someone I was working with passed on a rumour to me. I won’t say who the rumour was about, or where I was living at the time, because then I’d be guilty of doing what Joanna does and things don’t go so well for her! But it concerned a notorious figure who had once committed a terrible crime and who was now, allegedly, living as a protected person in a safe house in my neighbourhood. For a few days after hearing this rumour, I kept thinking about it and wondering if it was true. I found myself looking at my neighbours and people I saw in the street a little more closely than usual and whenever I saw someone of the right gender and age, I would speculate on whether it might be them. It got me thinking about how I would feel if I knew for sure that the rumour was true, and the difference between what’s in the public interest versus plain old curiosity. It also made me realise how we never really know who our neighbours and acquaintances are. After a while, though, I stopped thinking about it and got on with my life, but the notion of someone with a shocking secret trying to assimilate into a new community must have really resonated with me, because when I was trying to come up with ideas for a novel, it was one of the first things that came into my head. I wanted to explore how fast rumours spread and the damage they can inflict on individuals, so I deliberately decided to set the novel in a small community where there are more and closer links between the various inhabitants, and since I’d recently moved away from London and settled in a small town on the North Essex coast, I drew inspiration from my new environment. I should add, however, that although a few of the fictionalised place descriptions in The Rumour might be recognisable to residents in my home town, none of the characters are based on real people! The subject of The Rumour is called Sally McGowan - at least that was her name as a child when she killed a little boy - and as I started to think about the nature of her crime and her release back into society as an adult, it made me want to explore deeper, more fundamental issues, such as how far children, often victims themselves, can be held responsible for their crimes and whether true redemption is ever possible. I also started thinking about the vitriol levelled at perpetrators of such crimes that sometimes spills over into revenge fantasies and vigilantism, and how the press often fuels this by printing sensationalist stories. Our sense of disgust and outrage when it’s a murder committed by a child seems to be far, far worse than when it’s committed by an adult. Perhaps it’s because we think of childhood as a time of innocence and purity, so when a child carries out a violent crime, it shakes us to the core and makes us fearful. I like to think that my main character Joanna represents that side of us that on the one hand doesn’t like the idea of rumours and gossip and understands how dangerous such things can be, but on the other hand, can’t quite resist listening in. Speculating on a colleague’s love life, indulging in a spot of schadenfreude, or just having a guilty giggle about something we have no business knowing – it’s human nature, isn’t it, to be curious about others? And being chosen as the recipient of a juicy or sensitive piece of information makes us feel privileged. Someone has deemed us trustworthy enough to deal with the information sensibly, to keep it to ourselves. “Don’t say anything to anyone, but …” is the phrase that so often starts the conversation. And of course you won’t, because you’re not the sort of person who gossips. Or are you? The trouble is, once you know something you shouldn’t, it’s hard not to share it. It bubbles up inside and demands to be released. (But only to someone as trustworthy as yourself - that goes without saying.) And so it spreads, faster and further than wildfire. 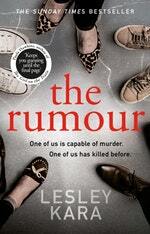 But as Joanna in The Rumour soon finds out, a casual comment is all it takes to change a life – for ever.